Can Genetics Impact the Right Vitamin Recommendations in Macular Degeneration? Ocular vitamins have long been a mainstay for macular degeneration management, since the first AREDs study was reported back in 1999. Subsequent investigations have adjusted what vitamins to include in our recommended formulas: removing beta carotene, adding lutein and zeaxanthin, not adding Omega 3s... It has been an active and ongoing investigation to determine which supplements truly seem to help. But a recent article published by Dr. Awh in Ophthalmology has raised a new question: does your genetic make-up influence what supplements work for you? The results were surprising, and have the ocular medical world taking a second look at just how important genetic testing with macular degeneration might be. Dr. Awh's study is a review of AREDS study results, dividing the study into 3 different genetic groups and running a "sub" analysis of the data. He parsed the study participants into different categories based on the presence of known genetic polymorphisms linked to macular degeneration: complement factor H (CFH) and the aptly named gene age related maculopathy sensitivity (ARMS). The results were surprising: the presence of certain genetic markers appeared to correlate with very different levels of effectiveness with vitamin supplementation. These patient groups not only did not appear to benefit from certain supplements, they seemed to get worse! The AREDS study participants when separated by their genetic profiles appeared to perform better with specific components of the standard recommended AREDS vitamin supplementation plan. 2 ARMs genes? 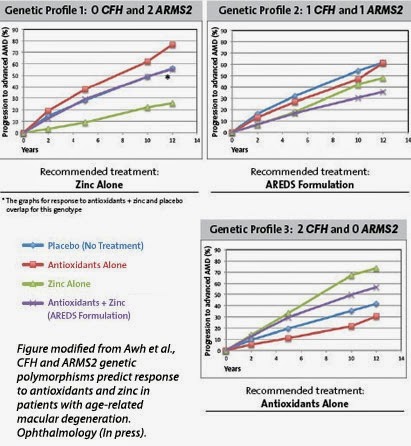 Prescribing antioxidants looked to make these people worse; zinc alone worked better! 2 CFH genes? Adding zinc seemed to make things much worse, and anti-oxidants only was the better path. The sub analysis appears to demonstrate that the supplements that may help some people with macular degeneration, may actually hurt other people with the disease, all based on their genetic make up. Genetic testing is officially not recommended by the American Academy of Ophthalmology for macular degeneration at this time, and these study results alone will not be enough to turn the tide. While the results are initially compelling, there have been numerous holes punched in the design of Dr. Awh's review. The biggest flaw is that Dr. Awh's report was a subanalysis of an existing study -- a study not designed to separate treatment for macular degeneration based on genetic make up. While 1000 people were included in the study, there was not an even distribution of different allele types. We also have to keep in mind that the AREDS study itself shows only modest benefit for nutritional supplementation, but since we have no effective treatment for dry macular degeneration at this time, it is one of the few recommendations that can be made. 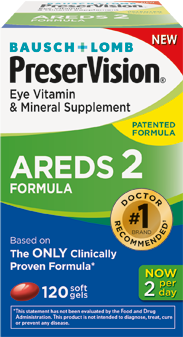 AREDS reports that there is only a 25% reduction of risk that macular degeneration will progress with the addition of AREDS 2 formula vitamin supplementation. That means 75% of time macular degeneration will still progress, even if you take the supplements. Not exactly the ideal treatment plan. Intermediate AMD: extensive intermediate sized drusen (64-124 microns), more than one large (>125 microns) drusen, or non-central geographic atrophy. Advanced AMD: Central geographic atrophy or neovascularization causing vision loss (visual acuity worse than 20/32) in one eye. Note for OD readers: the average optic nerve is 1500 microns, and the average vein width at the nerve is 120-150 microns, so if the drusen is about the width of the vein as it exits the nerve, then it is a large drusen.